Lassen Volcanic National Park is a real-life dictionary of volcanic geology. The volcano had a series of eruptions less than a century ago, creating cinder cones and hardened lava fields, as well as active features such as hot springs, hissing, steaming fumaroles, boiling mudpots and pungent sulfur vents that are reminiscent of Yellowstone National Park, although at a much smaller scale. What differs from Yellowstone is the visitation, which is one order of magnitude smaller. Among the best kept secrets of the many natural treasures in California is that even in the middle of summer, a visit to Lassen Volcanic will be uncrowded. This is especially true if you explore areas other than the scenic drive (highway 99), which is the main focus for most visitors. A wonderfully quiet such out-of-the-way area is found around Butte Lake. The crown jewel there is the Cinder Cone. From its top, which can be reached through a hiking trail (unlike, for instance the Sunset Crater, off limits to hiking), there are impressive views of the volcanic landscape, over the Fantastic Lava Beds, Painted Dunes (that I find particularly unique), and Mt Lassen in the distance. The cone itself is also interesting, as you can hike two concentric crater rims circling a bowl-shaped crater. 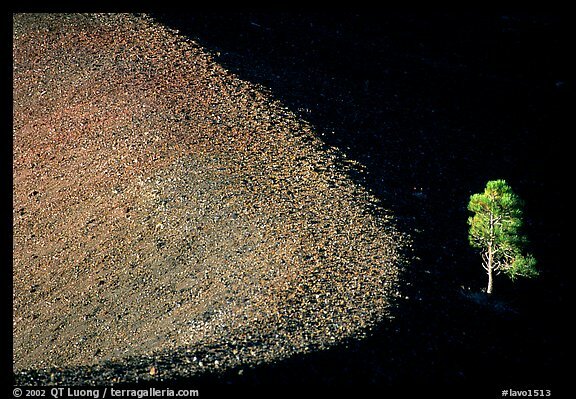 You can photograph wide panoramics, or concentrate on abstracts. To get to Butte Lake from the main road through Lassen Volcanic Park (Highway 99), exit the north end of the park, drive Highway 44 to Old Station, head east towards Susanville, and then turn south on gravel road that ends near a pleasant campground. 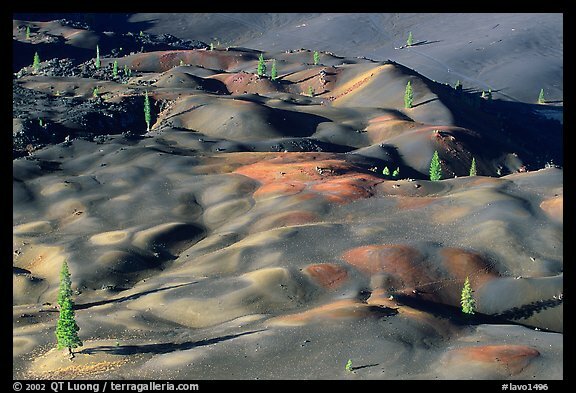 The trail to the top of Cinder Cone is 4 miles round trip, 5 if you circle the cone by following the trail down on the South Side to get a close view of the Painted Dunes, which I recommend. It starts at the parking lot, and follows the edge of the massive lava flow called Fantastic Lava beds. The Cinder Cone is 800ft high. Being steep, and made of loose cinder (surprised ? ), it is quite strenuous to hike up. Volcanic landscapes can be harsh looking at mid-day. If you want to get there for sunrise, you should depart the trailhead in the dark, no later than than one hour before sunrise. 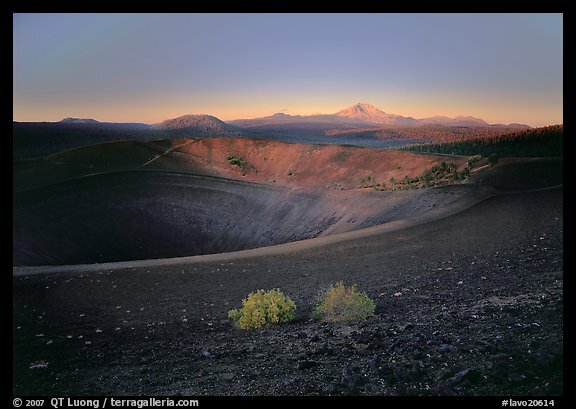 View all images of Lassen Volcanic National Park. Posted on January 14, 2010, 1:28 am, by QT Luong, under National Parks Photo Spots. To my eye these are the finest images of Lassen that I have seen. My only regret is not being able to see them as large prints. All of them are great and I agree with Guy; I would very much see them as large prints. Fabulous! #3 looks like a model, a painting… Nice to see something from a place less-visited. I’m stopping there this September, and these are inspirational. Thanks for posting. or was it over 200 mm? I guess you did not use wide angle (correct me if I’m wrong). For a person with average fitness how hard is the hike up Cinder Cone…………..if one does it slowly with a rest every say 1/2 hr could one do it in say 2 ~ 2.5 hrs ? The first image used the equivalent of a 24mm lens. For the two last, I’d say a short tele (around 100mm). 2h should be plenty to hike up.